Pedagogy works diligently to bring you industry leading education, and when we find other companies that offer valuable tools, resources, or products we work to partner with them to bring their products to you. 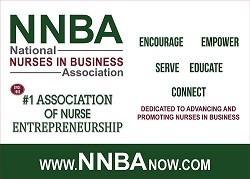 Pedagogy is so excited to be partnering with the National Nurses in Business Association. They are a wonderful resource for aspiring nurse entrepreneurs, nurse entrepreneurs, self-employed nurses, or nurses in business. To learn more about membership with the NNBA - Click Here. The NNBA is getting ready to host their 31st National Education Conference in Las Vegas Nevada. Members of the NNBA save $100 on their main conference registration! For information about the Conference and registration, Click Here. The long awaited HIPAA audits are now beginning. In an annoucement on March 21, 2016, the federal Office for Civil Rights (OCR) described the initial phase as primarily "desk audits," but with some on-site visits. Our partner, MyHIPAAGuide.com can help with comprehensive compliance resources, including risk assessment tutorials and templates for security policies and procedures. Visit www.MyHIPPAGuide.com to learn more. Nurse Born Products carry an array of products for nurses, about nurses, from nurses. Nurse Born Products started with the Nurse Born Stethoscope Holder an important little clip for your stethoscope that helps take the weight off your neck. From there it became their mission to find awesome, unique, quality made products inspired by or invented by nurses. Click here to view their entire catalog! Pedagogy has partnered with the Green Clean Institute to bring professional development education for frontline staff that promotes proactive best practices within environmental health services operations. Environmental Services Technician Certification program is an 12 month education program that once successfully completed offers your staff a certification. To see the education on environmental services cleaning offered by Pedagogy and the Green Clean Institute, Click Here.